The other night I had the opportunity to attend a Marine Executive Association (MEA)-West meeting. What is the MEA, you ask? I’m glad you did, because it is a great resource for transitioning servicemen and women because it leads to something we all need: jobs. The MEA is a networking organization where people like me who are leaving the service can meet others who are transitioning as well as business people who need quality people to join their organizations. 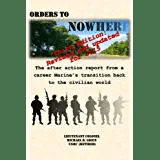 It is informal (after all, the only rank anyone has after they get out is “Marine”) and informative, because most of transitioning military types really don’t know that much about civilian employment. The association is open to all services, and in the most recent meeting that I attended there were Air Force, Army, and Navy vets there too. Transition is the great equalizer and now that we all dress the same we share the same concerns and have the same need for employment, so the inter-service rivalry goes right out the window. We’re all in the same boat now. The meetings are monthly occurrences. On the third Wednesday of the month the attendees gather to socialize and have a drink at Iron Mike’s, which is the Staff Noncommissioned Officer’s club located in Camp Pentleton’s South Mesa events center. After a half hour or so, we all migrate over to a meeting room where a guest speaker will talk to the crowd about what it’s like on the other side of the fence. Our speaker for the last meeting was Kim Shepherd, the Chief Executive Officer of the Alfred P. Sloan award winning placement firm Decision Toolbox. She gave us tremendous insights into the business world, with a strong emphasis on how to evaluate yourself in order to find what you are really interested in doing in your next career. Kim was followed by a group of business leaders from the Los Angeles area who are interested in helping veterans learn more about the business world. They are a group of great Americans who want to help vets find jobs, and they shared some great ideas and recommendations to help veterans make it from job seeker to job finder. One of the great aspects of MEA meetings is that we get to hear about the corporate sector from corporate professionals, and the insights that they give are priceless. It isn’t every day that an industry leader takes the time to mentor a pool of job seekers, but it happens at the MEA. Research has shown that roughly 80% of jobs are found through networking – so getting to know people is certainly in your best interest as you transition! After the guest speakers are finished we all introduce ourselves. This is a chance to give your “elevator pitch”, which is a thirty to sixty second sound bite about yourself and what you are looking for. You never get a second chance to make a first impression, and by standing up in front of a room full of people it gives you a little practice. It also lets the employers in the room know if you are someone that fits their needs, and I have personally witnessed vets get job interviews on the spot after the introductions are finished; such is the power of networking! The introductions are the last part of the structured meeting. Once they are completed the formal part of the meeting is done it is a little like a high school dance as job seekers work their way across the room to meet up with businesspeople who have pitched the opportunities available in their organizations. It is also when old friends catch up and new friendships are forged, or in other words, the networking tree grows a little stronger and new branches sprout. It is a great opportunity to get out there and see what the job market is like. Once you get plugged into MEA-West, you can begin receiving emails from the head of the organization. He sends out dozens of emails each week, and each one contains anywhere from one to ten or twenty job opportunities. Many of these opportunities are first listed in Steve’s emails, and a lot of veterans have found employment through the MEA. One former Marine who left active duty in the 1990s shared that every job he has taken since taking off his uniform has been through MEA-West networking, and he is far from alone. Even in this tough employment market there are jobs out there. Networking with the MEA will help you find them, so find out where and when the next meeting goes and belly up to the bar! 1. Networking works. In today’s economic uncertainty there are literally millions of resumes flying around, and the stories about people who have submitted hundreds or thousands of resumes without finding a job are constantly in the news. The vast majority of employment opportunities are found through someone you know, so increase your chances by getting out there and meeting people. 2. Help yourself as you network. If you don’t have personalized business cards yet, then get some printed up. I personally recommend that you go to a stationary shop and have a set professionally done with only your name and contact information printed on the card. This is for two reasons: first, you are looking for a job, and it is not the best idea to use the card from your current job to find a new one and second, handing a professional looking and feeling card with your name, phone number, and email address saves both you and the person you are interacting with from writing that info down on a cocktail napkin. Anybody can print out a flimsy card on their computer, but remember that the first impression is the most important. Do you want to be remembered as the cheapskate with homemade cards or the kind of person who puts some effort into finding a job? 3. Carry a resume. I will write a lot in the future about how to prepare a resume, but attending a networking meeting without your resume (and personalized business cards) is a bit like going to a nightclub in your pajamas – sure, you’re there but you aren’t really ready to participate. Many employers are looking to immediately fill positions, and the guy or gal with a resume will get the job before the one who doesn’t. Don’t be that person with empty hands when an employer asks for your resume! 4. There are countless networking organizations out there. MEA is just one, but there are commensurate organizations for all branches of the armed forces, for federal employees, civic organizations, etc. They are all tremendous resources that you can tap for free, and you will certainly meet some great people along the way that will help you along the path to employment. This entry was posted in Transition Posts and tagged active duty, career, EAS, Enlisted, Marine Corps, Marine Executive Association, military, Networking, Retirement, transition. Bookmark the permalink. Colonel, you bring great value and information to transitioning Marines, and service members of all branches. Please keep writing these kinds of blog posts, as transitioning veterans are the most vulnerable and disadvantaged community among the unemployed. Also, might I recommend that you (and others) take advatage of the benefits of LinkedIn; a professional social media networking site. And, for veterans, search for groups on LinkedIn that match your service branch. I especially recommend the group “The Value of a Veteran,” found at http://www.linkedin.com/groups?home=&gid=1833767&trk=anet_ug_hm. Good luck, Colonel, and to all transitioning veterans. Thanks, Dale! I appreciate your readership and comments. I am on linkedin as well- it is a great resource. I will check out the Value of a Veteran site.